This is a very nice goggle display. It holds 5 goggles easily even more if they are doubled up. It offers a nice mirror on top for easy viewing. 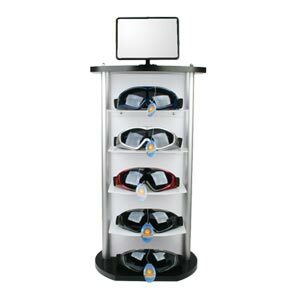 See more wholesale sunglass / goggle displays here. Here is a popular counter top display for sunglasses. • Goggles are NOT Included. • Height 28 in. x Width 12 in. Depth 10 in.